Maine winters can get quite long; but for me, it’s the perfect time to cook. While the winds blast us, and the trees groan with the snow, I’m busy in the kitchen, visiting the roots, researching new recipes, and creating the food that we all love to enjoy. On February 2, we observed Candlemas. This is not a celebration of Ground Hog’s Day, but a centuries old pagan holiday and custom of food and fuel reckoning. Years ago folks prescribed that for a family to survive until spring, they needed to have at least ½ of the food and fuel necessary to sustain the farm still remaining. Here on Rabbit Hill, the news is good. The roots are plentiful and look beautiful in the cellar and the hay barn is over ¾ full. 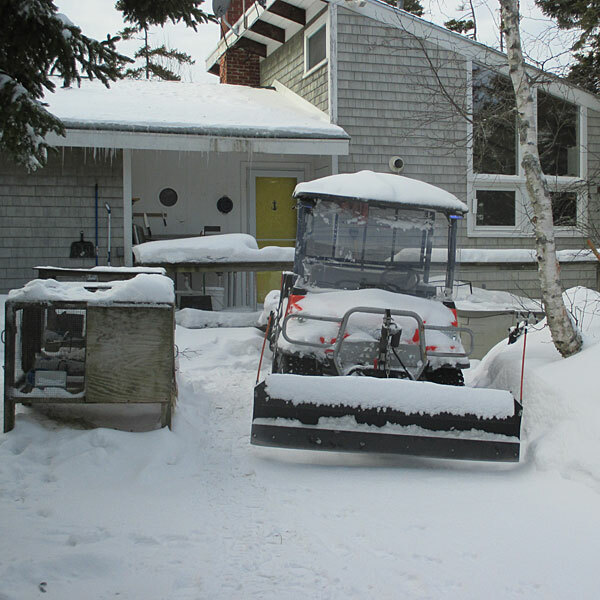 As the road is impassable until the snow melts, the propane needs to be monitored, but the wood supply is sufficient. There is plenty of meat in the freezer, and always clams to dig! So I stoke up the stove, crank up the tunes, and enjoy the benefits of our wonderful agriculture here in Maine. It may sound far-fetched and not quite possible, but our family is living testimony that folks can enjoy a delicious and nutritious diet eating Maine foods all year. 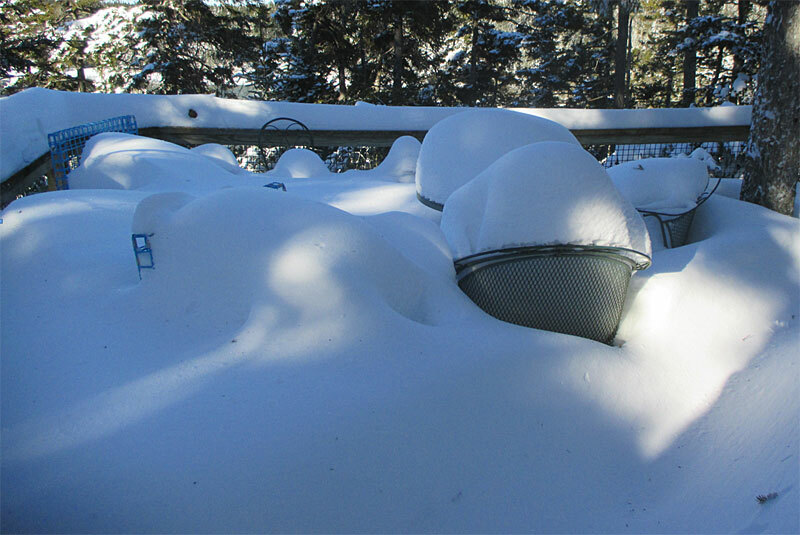 Over 58 inches of snow, still arriving daily! APPLE MAPLE BUTTER: Everyone agrees that this butter tastes like “apple pie in a jar”. Empire apples are simmered with organic Maine maple syrup and Barbour Farm apple cider and then lightly seasoned with spices. We make our butters and jams in a traditional, European style. The fruit is first cooked in the kettle, and then the skins and seeds are extracted. The puree is then returned to the kettle to create the butter or jam. 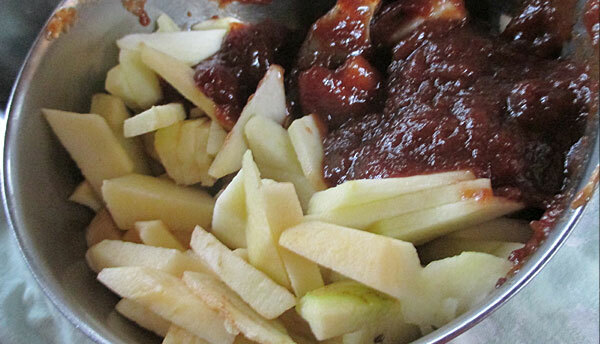 Both spreads are made without pectin…they are slowly simmered to bring out the natural fruit sugars. 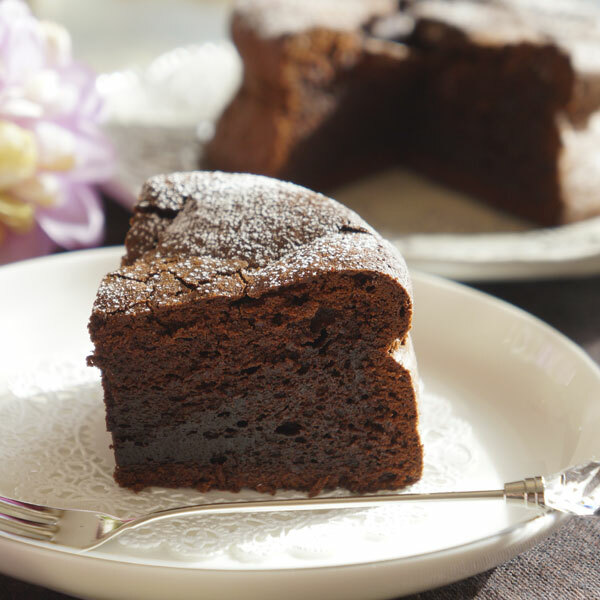 The result is a product that is almost seed-less, low in sugar, and quite delicious! RED PEPPER SAUCE: In this luxurious sauce, the lush sweetness of roasted red peppers is combined with a touch of balsamic vinegar and basil. We like to use this sauce as a base on pizza with caramelized onions, as part of a dip with feta, or in creative sandwiches. Steve Sinisi, from New Leaf Farm in Durham, is our red pepper grower. For over twenty years, the folks at New Leaf Farm have been producing organic vegetables. This exemplary organic farm uses extensive cover cropping and soil building techniques and their permanent greenhouses allow for season extension. For us, this translates to peppers and tomatoes. Preheat the oven to 350 degrees. Grease a 9-inch heart-shaped cake pan. Prepare the cake according to the package directions. Stir in the chocolate chips and dried fruit. Bake until toothpick comes out clean. Let cool for 10 minutes, and then remove from pan. Serve dusted with powdered sugar. Preheat the oven to 350 degrees. Grease the cake pan of your choice. Prepare the cake according to the package directions. Stir in the toasted coconut flakes. Bake until a toothpick comes out clean. Let cool for 10 minutes, and then remove from pan. 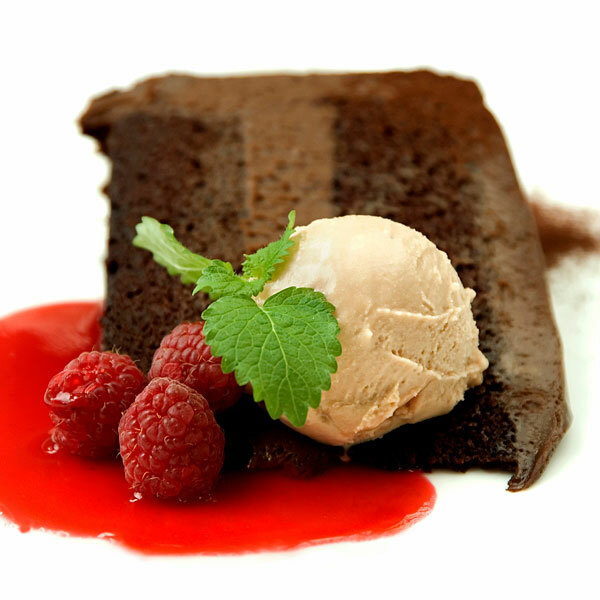 Serve with coconut ice cream. Frozen wild Maine blueberries act as the “ice” in this delicious and nutritious smoothie. Combine all ingredients in the bowl of your blender. Pour into 2 glasses and enjoy! *I like Quill’s End Farm vanilla yogurt. 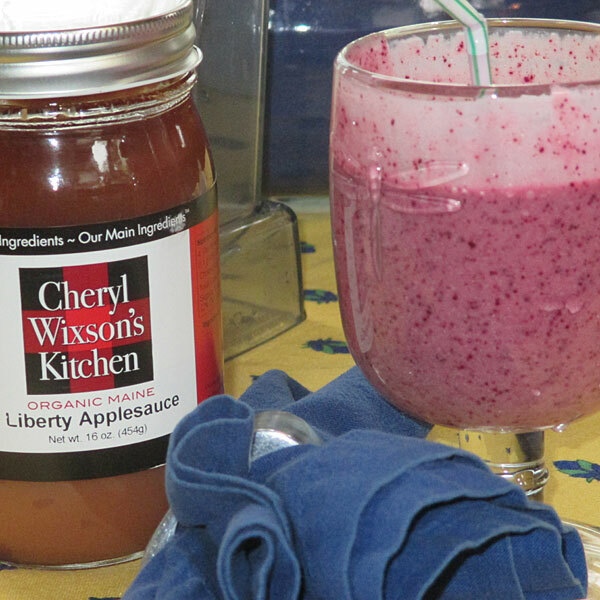 Try with Organic Maine Liberty Applesauce. Preheat the oven to 400 degrees. Peel and cut the apples into a large bowl. Stir in the apple maple butter and coat completely. Butter a sheet pan or large round pan (at least 10inches) Roll out the puff pastry on a well-floured surface to become a bit more circular, and transfer to the pan. 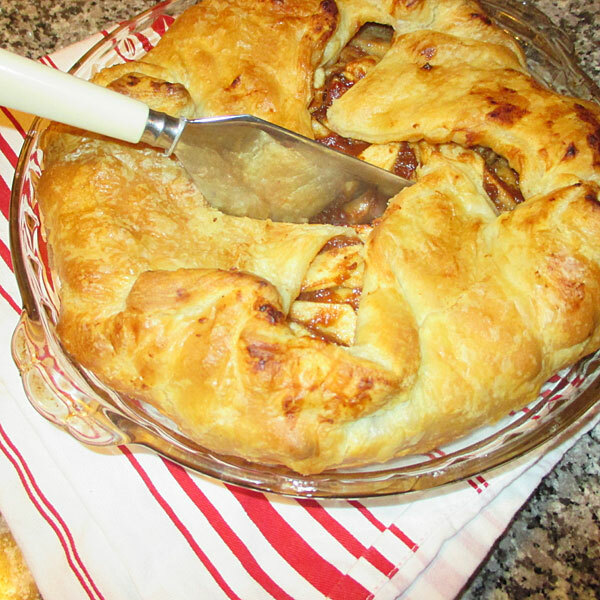 Spread the apple mixture on the puff pastry. 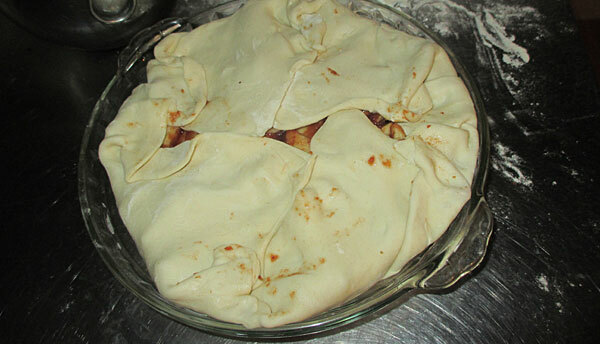 Gently turn up the edges, squeezing together as necessary to hold the filling in place and form a tart. Place on a cookie pan and bake until the puff pastry is golden brown, about 50 minutes. 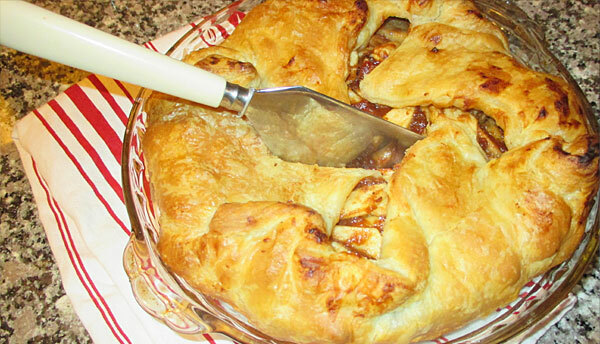 (Time varies with the apple variety) Serve warm or at room temperature. Makes eight servings. Nutritional analysis per serving: 378 calories, 3.2 grams protein, 49 grams carbohydrates, 26 grams fat, 114 mg. sodium, 3.4 grams fiber. * This tart really shines with a high quality, all butter, puff pastry. DuFour is my recommended brand. Available at John Edwards Market in Ellsworth. Set the oven on 450 degrees. In each of the six cups of your popover pan, dot about ¼ tablespoon of butter. Slip the pan in the oven for 30 seconds to melt the butter. Once melted, generously grease the cups of the popover pan with the melted butter. In the jar of your blender, beat the eggs with the milk briefly. Add the flour and salt and blend at high speed until just blended, about 15 seconds. Be careful not to over mix. The batter should be the consistency of heavy cream. Pour the batter into the greased popover pan. 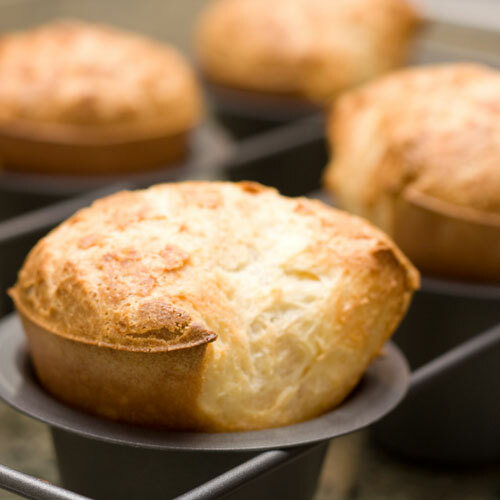 Bake in the 450 degree oven for 18 – 20 minutes, until the popovers have “popped”. Turn the oven down to 350 degrees and bake until they are golden brown and crispy on the outside, about 18 – 20 minutes longer. Remove from pan and serve at once. Popovers keep for a day or two and may be reheated in a 350 degree oven. Nutritional analysis per serving: 141 calories, 6 grams protein, 18 grams carbohydrates, 5 grams fat, (0 grams trans fat), 160 mg. Sodium, 1 gram fiber. This is an elegant and nutritious pie. Enjoy with a local Maine beer! Preheat the oven to 425 degrees. Sprinkle a 12-inch pizza pan with corn meal. On a well-floured surface, roll out the dough to fit the pan. Brush with olive oil, and spread with the Roasted Red Pepper Sauce. 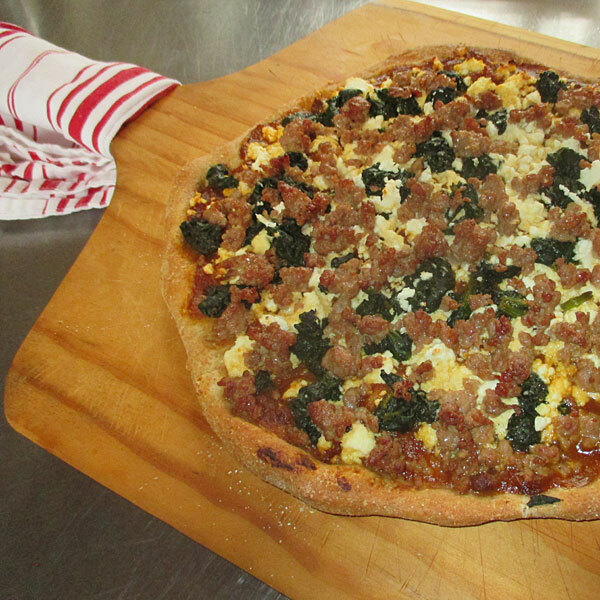 Sprinkle the ricotta over the top, then add the chopped spinach and crumbled sausage. Complete with the feta cheese. Use this easy, breach machine pizza dough to make pizza or calzones using any of our Pasta & Pizza Sauces. Put all ingredients in bowl of bread machine. If you are using the timer, add the yeast last and be sure it does NOT touch the liquids. Set on dough cycle. This makes enough dough for 2 – 12 inch pizzas or for 6 calzones.